High fructose corn syrup originally made from corn starch is can be made from potatoes are simply combining glucose and fructose. 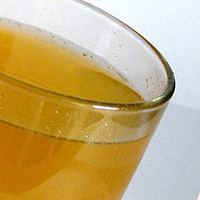 It is a common ingredient of juice and most soda pops. Depending on the ratio between glucose and fructose the classification may vary. High fructose syrup contains at least 90% fructose content. The calories in High Fructose Corn Syrup per 21g(1tbsp) is 58 calories. High Fructose Corn Syrup is calculated to be 276Cal per 100 grams making 80Cal equivalent to 28.99g with 15.75g of mostly carbohydrates、0g of protein、0g of fat in 21g while being rich in vitamins and minerals such as Iron and Phosphorus.